TARGETED TOWARDS NEXT YEARS MAGIC MILLIONS! 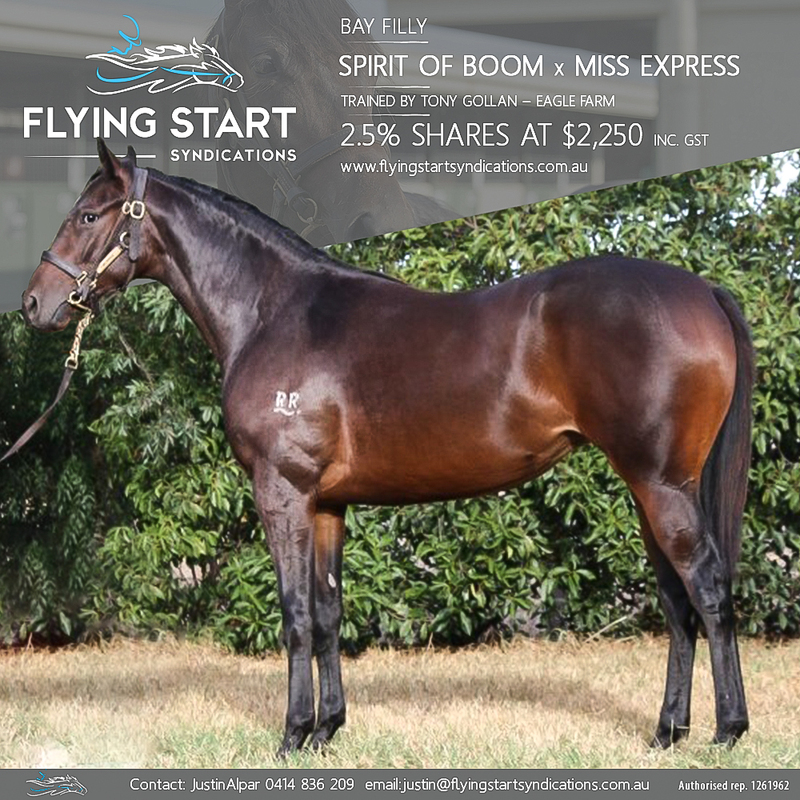 This Filly’s Trainer – Tony Gollan also trained SPIRIT OF BOOM himself so knows the breed better than anyone. His current SPIRIT OF BOOM stakes horses include EF TROOP & OUTBACK BARBIE. Paid up & eligible for the rich MAGIC MILLIONS RACE SERIES! 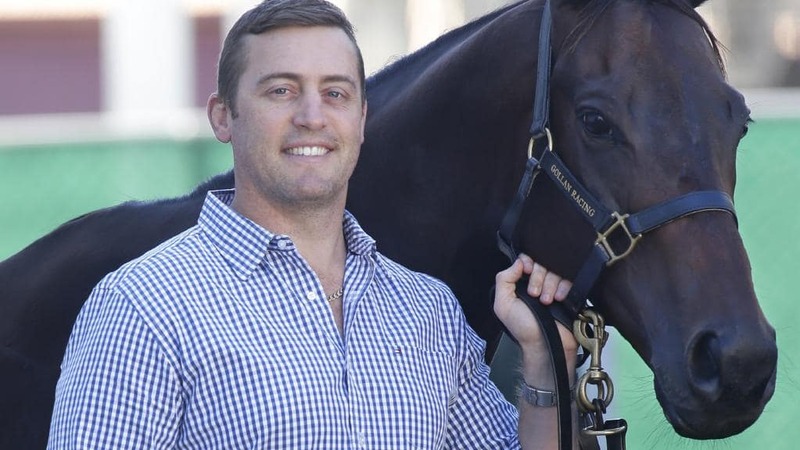 Share price includes insurance for 6 months, training, breaking in, spelling, veterinary costs, MAGIC MILLIONS Race Series & QTIS registration until 1st July 2019. MISS EXPRESS, by Lonhro. Winner at 1200m in Aust. Half-sister to CARNEGIE EXPRESS. This is her second foal. Her first foal is a 2YO. CARNEGIE EXPRESS (Carnegie). Second on the 2001-02 Australasian 3YO Classifications (intermediate & long). 6 wins from 1400m to 2000m, A$1,132,385, STC Canterbury Guineas, Gr.1, Rosehill Guineas, Gr.1, Gosford Guineas, L, STC Do It at Diggers' H., Silver Saddle Brasserie H., 2d Australian Derby, Gr.1, 3d STC Hill S., Gr.2, 4th STC Ranvet Rawson S., Gr.1, AJC Craven P., Gr.3. Miss Express. Winner. See above. Tammany Hall. 4 wins to 1400m to 2017-18, TTC Australian Trainers Association H., 3d TTC Relay for Life H.
Sebring Express. 4 wins-2 at 2-at 1000m, 1100m, A$123,870, to 2018-19, 2d ATC All Too Hard at Vinery H., 3d ATC Bondi Pizza H., Pluck at Vinery H.
Chase the Wind. 5 wins to 1200m to 2018-19, Ipswich TC Schweppes H., 3d Ipswich TC Channel 7 H.
TRIS (Street Boss). 4 wins-2 at 2-at 1100m, 1200m, A$161,530, to 2017-18, SAJC Breeders' S., Gr.3, 2d MRC Grand Hotel Frankston H.
Locomotive. 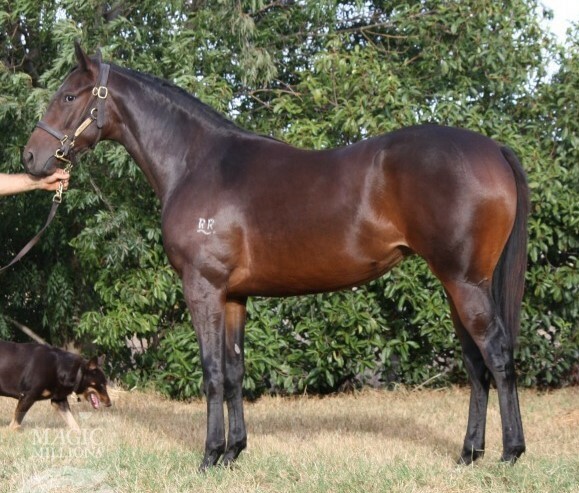 Winner at 1400m in 2018-19, 3d Perth Racing Glenroy Chaff H.
Can Get a Witness. 4 wins from 1550m to 1650m in 2018-19 in Aust. Pan Pipe. 4 wins from 1500m to 2500m, VRC Reckless Welter H., MVRC Costas Mitre Ten H., 2d STC St Patricks Old Boys H.
STARVOIA (Starcraft). 6 wins to 1200m, NZ$157,075, to 2017-18, Otago RC Mosgiel S., L, 2d Otago RC New Zealand Bloodstock Insurance Breeders' S., L.
FATAL (Bakharoff). 9 wins from 1350m to 2150m, NZ$192,625, A$5,200, BOP RC Japan-New Zealand International Trophy, Gr.2, Hawkes Bay Windsor Park Stud H., Bay of Plenty Cup, WRC Douro Cup, Hawkes Bay Best Travel H., 2d ARC Easter H., Gr.1, 3d WRC Thorndon Mile, Gr.1, Waikato RC International S., Gr.1.